ANSC Bank Recruitment 2019 - Job notification for 100 Clerk, Junior Auditor & Other Posts in ANSC Bank, Port Blair, Andaman & Nicobar Islands. 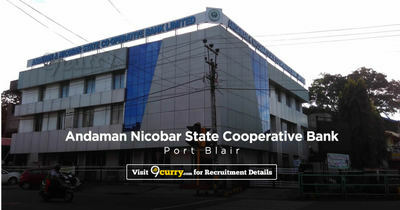 Applications are invited by Andaman Nicobar State Cooperative Bank on or before 30 Apr 2019 04:30 PM for 100 vacancies. 06 1. B.Com degree with not less than 03 years experience in the field of Finance and Accountancy in a Chartered/ Cost Accountant from any Banking Institutions. Eligible candidates may send their application in prescribed format (attached below) to Managing Director, Andaman & Nicobar State Cooperative Bank Ltd., Head Office,98, Maulana Azad Road, Port Blair, Pin – 744101 on or before 30 Apr 2019 04:30 PM, along with self attested copies of proof of age, Educational Qualifications, Category (Scheduled Tribe Certificates in respect of Scheduled Tribe Candidates & OBC Certificates in respect of OBC candidates), Proof of Identity (a copy of any other identity card issued by Government & all relevant supporting documents for claiming age relaxation. The Andaman & Nicobar State Cooperative Bank Ltd., 98, Maulana Azad Road, P.B No. 289, Port Blair - 744101.